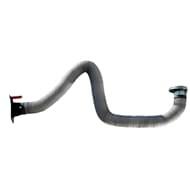 The WORKY arms of the SB series have been designed to extract welding fumes from the work area; that is why they have at least 3 articulations for moving in each direction and remaining stable in the desired position. With a range of models varying from 3 to 9 m in length and 150 or 200 mm in diameter, they always extract from the correct point. 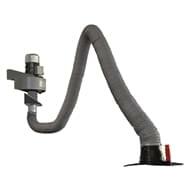 A series of included accessories like the wall bracket, the integrated shutter valve and the swivel that allows 360° rotation make the SB arms the ideal solution for all installations (wall, ceiling and also the version sliding on an overhead rail). 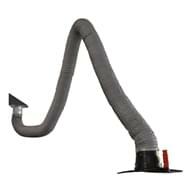 One option is to have the lighting kit mounted in the hood, a hermetic closing system with automatic valve. 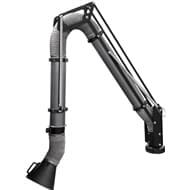 In the rigid version (SB) and in the flexible version (SBF) the WORKY arms can be coupled with the extraction motor to have a compact and cheap system. 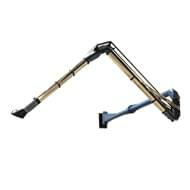 Self-supporting articulated arm measuring 150 mm in diameter for extracting welding fumes equipped with supporting bracket and shutter valve. Self-supporting articulated arm measuring 150 mm in diameter for extracting welding fumes equipped with supporting bracket and shutter valve and fan. 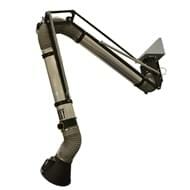 Self-supporting articulated arm measuring 150 mm in diameter with flag extension for extracting welding fumes equipped with supporting bracket and shutter valve. 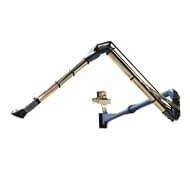 Self-supporting articulated arm measuring 150 mm in diameter with flag extension for extracting welding fumes equipped with supporting bracket and shutter valve and fan. 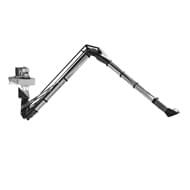 Self-supporting arm measuring 160 mm in diameter with flag extension, aluminium inner articulation and outer flexible hose for extreme positioning flexibility. 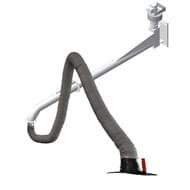 Self-supporting arm measuring 150 mm in diameter with wall bracket, aluminium inner articulation and outer flexible hose for extreme positioning flexibility. 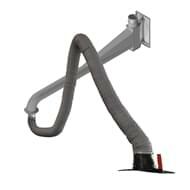 Self-supporting arm measuring 150 mm in diameter with wall bracket, aluminium inner articulation and outer flexible hose for extreme positioning flexibility and fan. 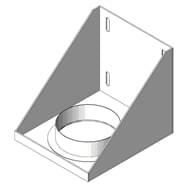 Wall bracket for arm, diameter 150 mm.